The Los Angeles County Health Agency invites community leaders, agency staff, County departments, and other stakeholders to provide input on the Center for Health Equity Action Plan and identify ways we can work together to build a movement for health equity. Join the Movement on Wednesday, October 3, 2018. Unfortunately, the California High Speed Rail Authority has recommended the SR-14 route which is the one that runs through Pacoima. The CHSRA thinks horse trails communities are more important than a densely packed ,working class , people of color community . Please show to one of these meetings and voice your concerns. Tuesday, February 21 is the deadline to register to vote in the March 7th Election. March 7th’s Municipal Election has important LAUSD Schoolboard, Los Angeles Community College, County, and City measures on the ballot. In order to participate you must be registered to vote by Tuesday, February 21. ?Need an extra buck or two? The Los Angeles City Council on Wednesday voted unanimously to decriminalize street vending — a move long sought by immigrant advocates who argued that sidewalk sellers should not face criminal charges that could place them at risk of being deported. On Wednesday, the LA City Council voted to require regular updates of the city’s community plans. As a result, the Department of City Planning will build a framework that accelerates updating the city’s 35 community plans to once every six years. The provisions of the new LAMC Section 85.02 became effective on Saturday, January 7, 2017 and shall expire on July 1, 2018, unless extended by ordinance. The Los Angeles Police Department (LAPD) has indicated enforcement will begin in early February. Come hear from both sides! ?The Los Angeles Office of Finance is reminding entrepreneurs, business owners, and individuals that conduct business activities within the City of Los Angeles that it’s time to submit their Business Tax Renewal Form. February is African American Heritage Month. This week, the Los Angeles City Council and Mayor Garcetti kicked off of the month-long celebration to recognize and honor the vast contributions of African Americans to our communities, cities and country. "Alexa, ask L.A. City what City Council meetings are happening tomorrow." The free L.A. City Skill for Alexa has been updated so Angelenos with an Amazon Echo, Amazon Dot, or any other Alexa-enabled device can “Ask L.A. City” about City Council, Council Committee, and featured events occurring within the City. ?Community leaders representing 46 Neighborhood Councils met with General Managers Laura Trejo of the Aging Department and General Manager Jan Perry of the Workforce and Economic Development Department in LA’s first Neighborhood Council Purposeful Aging Liaison Town Hall. 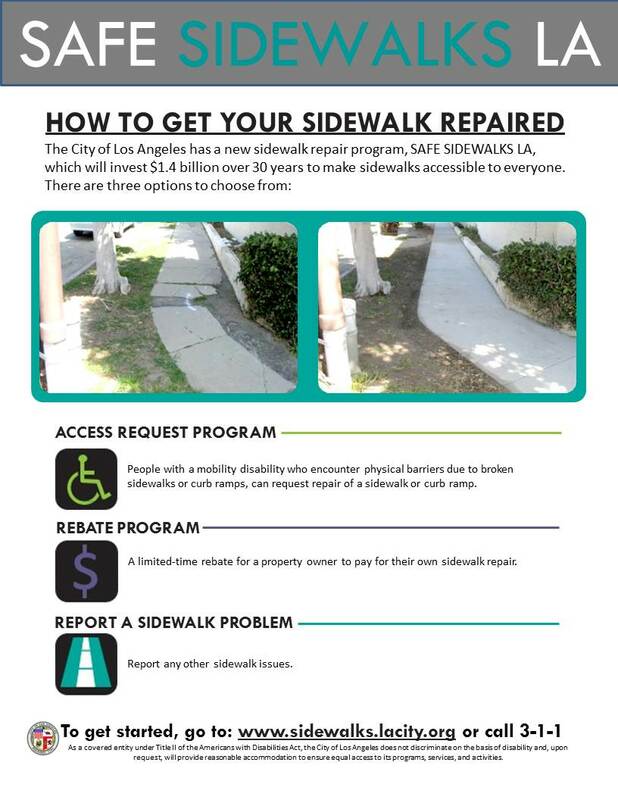 ?The City of Los Angeles has launched an unprecedented sidewalk repair program, SAFE SIDEWALKS LA, which will invest $1.4 billion over 30 years to make sidewalks accessible to everyone. These repairs will improve neighborhood safety and boost the quality of life. ?The Los Angeles City Council just approved the purchase of 42 acres of property at the center of plans to revitalize the Los Angeles River. Known as the G2 parcel, the property is the final remnant of the 250-acre Taylor Yard owned by Union Pacific Railroad. The series of storms that culminated with Sunday’s record-setting rainfall caused millions of dollars in damage to the region. Controller Ron Galperin invites you to the Financial Planning for After-Holiday Stress workshop on January 25, 2017 from 6:00 p.m. – 7:00 p.m. at the North Hollywood Amelia Earhart Regional Library. Join the Office of Los Angeles Mayor Eric Garcetti and the City’s Entrepreneur in Residence Jason Nazar, for one of the City’s largest Technology Job Fairs taking place on Thursday, January 26th from 11-8pm at The Reef in Downtown Los Angeles. Zero Waste LA is a new public private partnership designed to address the 3-million tons of waste disposed annually by businesses, consumers and residents. This innovative franchise system establishes a waste and recycling collection program for all commercial, industrial, and large multifamily customers in the City of Los Angeles. During the day of Tuesday, 1/24/17, LAHSA is requesting the assistance of 4-5 mobile teams to cover large areas of SPA 2, specifically census tracts near Agua Dulce and the Foothill areas near Lake View Terrace. ?Tax season is just around the corner. YPI and Computer & Communications Industry Association have partnered up once again to bring you a FREE Tax Preparation Assistance Event on Sunday, February 5, 2017.
n November 23, 2016, the City adopted an ordinance repealing Los Angeles Municipal Code (LAMC) Section 85.02 in its entirety, in response to a U.S. Court of Appeals judgment and replaced it with a version that decriminalizes living in vehicles, while balancing the needs of all City residents, businesses and visitors for clean, healthy and safe public areas. The cost to settle suits such as police brutality, wrongful imprisonment, and disability act violations has LA in a precarious position. Winter Shelters to Remain Open 24 Hours Starting Sunday at 5 P.M. The Los Angeles Homeless Services Authority announces the temporary extension of hours at most winter shelters. The following shelters will remain open for a 38 hour window from Sunday, January 8th at 5 p.m. until Tuesday, January 10th at 7 a.m. due to cold and wet weather conditions. On Tuesday, January 10th at 7 a.m. most shelters will resume normal hours. The Los Angeles Department of Water and Power (LADWP) is opening the application period for the Community Partnership Grant that will be awarded to our local non-profit organizations. ?The 2017 Homeless Count is looking for volunteers for this year. Please see the information below. Los Angeles County has the highest unsheltered homeless population in the nation, but we don’t have to accept homelessness as an insolvable problem. Together, we can help end this. Los Angeles residents have several options for recycling their Christmas tree this year. This week the Public Safety Committee approved a grant from the Innovation and Performance Commission for the Los Angeles Fire Department (LAFD) SOBER Unit pilot program. ?The City Council voted 12-0 to curb the size of homes that can be built on small lots, as the ‘McMansion’ trend divides LA neighborhoods. ?Today the L.A. City Council unanimously approved our game-changing Zero Waste L.A. program, which will implement a complete overhaul of commercial and multi-family waste collection and dramatically increase recycling throughout the city. A program initiated by a Councilmembers Huizar and Blumenfield motion to save energy by working with the City’s largest energy consumers to better track their usage and increase their efficiency is scheduled to be considered by the Los Angeles City Council next week. Come Join Us at the Pacoima Holiday Parade this Saturday, December 10! The holiday season is fast approaching. It’s an exciting time of year where you and your loved ones will be observing time-honored traditions. Do you want to speak up about the proposal to hold the 2024 Olympics Opening Ceremony in the new Rams football stadium instead of the historic Coliseum? ?In a move to ensure the quality of life in the nation’s second largest city, and to protect LA’s highly diverse communities and residents, the City Council recently approved the creation of an Ad Hoc Committee on Immigrant Affairs. ?This week, the Los Angeles Homeless Services Authority announced the opening of its 2016 Winter Shelter Program from now through March 1, 2017. The Los Angeles City Council set into motion today the initial stages of a $1.4 billion plan to repair a backlog of broken sidewalks that will allow the city to turn over the responsibility of future upkeep to property owners. ?A Los Angeles man fought the law and won, and now the city has to stop farming out its parking ticket appeals to a for-profit company. A court-appointed monitor has verified at least $67.5 million in refunds owed DWP customers in the aftermath of the overbilling scandal. This week has been difficult on a lot people. However, we cannot forget those who have protected us and have allowed us to engage in the civic process. We thank you, America’s service members, veterans, and military families, for all of your sacrifices, not just on Veterans Day, but every day. On November 8, there is much at stake for our country and our communities. We will be electing a new President, electing a new U.S. Senator for the first time in more than two decades, and casting votes for other federal and state offices. ?This week, the City Council approved a motion to increase Neighborhood Council funding by an additional $5,000 each year. ?The City of Los Angeles has recently embarked on a four year journey to update the General Plan. The General Plan is the constitution for future growth and development within the city. It is at the heart and foundation of the city’s long-range vision and serves as the basis for decisions that affect all aspects of our everyday lives – from where we live and work to how we move about and where we spend our time with friends and family. Senator Hertzberg will be hosting a Coffee at Pacoima City Hall for Veterans. We hope that service men and woman will join us for coffee and conversation. Please share with all the honorable veterans in the community. Just 15 months ago, Council President Herb Wesson appointed Councilmember Paul Krekorian chair of the Ad Hoc Committee on Comprehensive Job Creation Plan (Jobs Committee) to present a strategy to stimulate economic and job growth throughout the city and overhaul the way LA serves the business community. The comprehensive Job Creation Plan that was presented to the Los Angeles City Council accomplishes that goal. The Office of Congressman Tony Cárdenas invites you to the Annual Veterans Day Forum on November 11 from 4:00p.m. to 7:00p.m. at Richard E. Byrd Middle School, 8501 Arleta Ave, Sun Valley, CA 91352. This event is free and will provide food, entertainment, and resources for the Veteran, friend, and family. 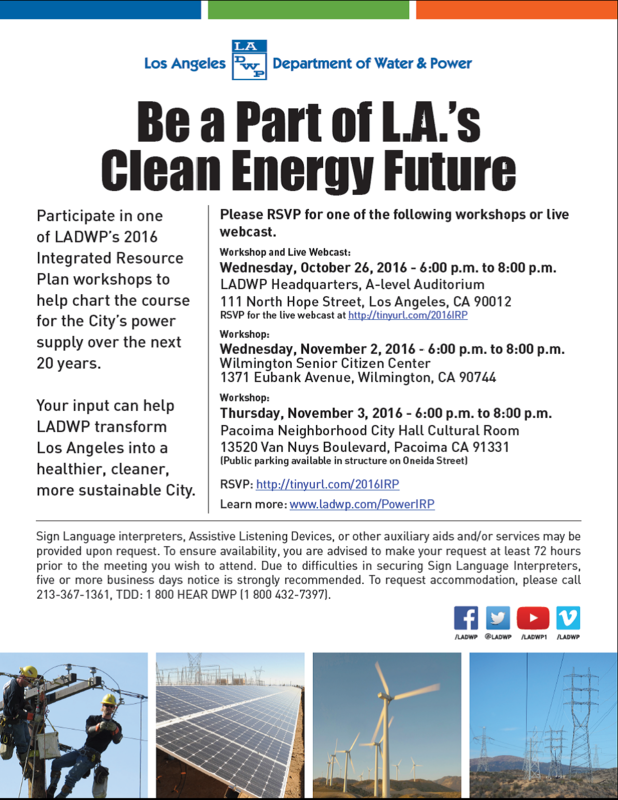 Participate in one of LADWP’s 2016 Integrated Resources Plan workshops to help chart the course for the City’s power supply over the next 20 years. Your input can help LADWP transform Los Angeles into a healthier, cleaner, more sustainable City. Trump or Clinton? Legal marijuana? No more death penalty? Property tax increases? Homeless aid? There’s a lot at stake this election. County election officials reminded residents Thursday that Monday is the deadline to register to vote in the upcoming election. The City Council is in the beginning stages of an open and public conversation about how best to regulate all aspects of the marijuana, or cannabis, industry within the City of Los Angeles. A Call for Cool Block Leaders! ?The nonprofit Neighborhood Council Sustainability Alliance (NCSA), in collaboration with the City of Los Angeles, invites Neighborhood Councils and city residents to learn about Cool Blocks LA, a free, five-month pilot program that helps neighborhoods become planet-friendly, disaster-resilient, and community-rich. ?Our parks are important to our communities. This questionnaire is a great opportunity to let the City of Los Angeles know your thoughts about our parks. What is working? What needs improvement? What’s missing? What would you love to see more of in your community park? Sincere thanks to everyone who attended and supported the Valley Disaster Preparedness Fair on Saturday, October 1, 2016. A very special Thank You to those Neighborhood Councils that hosted an Outreach table. We had a great turnout with about 3,000 attending. ou are invited to attend an Educational Symposium on providing alternatives in education for an underserved population. As we are all aware, not every student thrives in a traditional setting. ?Is your passport about to expire? Are you a Veteran waiting on a VA claim? Or maybe you just want to pay a visit to some friendly dogs and cats. Come by the mobile office today – Saturday, October 8 from 12 p.m. to 3 p.m. at the Best Friends Animal Society, 15321 Brand Blvd, Mission Hills, CA 91345. ?This year’s Congress of Neighborhoods for the Neighborhood Councils (NCs) was up in attendance by the hundreds and consistent in quality as previous years. This month, the City Council voted to support a plan to simplify the process to allow for new neighborhood councils in smaller communities that are part of existing NCs. The old de-certification process was an unfair and overbearing process to people who serve as volunteers. Confused about what’s being built in your community (and what isn’t)? Learn how City Planning works! ?This week, the City Council voted to grant legal status to existing second dwelling units, i.e., granny flats, and impose greater restrictions on future units. To help understand the Council’s new ruling, here is a breakdown of how it will impact you. The City of Los Angeles is making it easy to start a business with the launch of its new online platform: Los Angeles Business Portal, a one-stop-shop that has all the information you need to get your business of the ground. The voice of the Dodgers, the voice of baseball, Vin Scully will call his final game at Dodgers stadium Sunday after 67 years in the booth. It’s the endless and favorite debate of all sports fans: Who is the greatest of all time? ?Aside from a free digital subscription to the New York Times, the access and benefits an LA Public Library card can provide really does make it the best card in LA. ?Marie Verdin was last seen around 12:00 am on 9/18/16 at her home in Pacoima, CA. She was wearing a v-neck t-shirt and sweat pants. She may also be wearing a green jacket and white Jordans or Vans. she does not have her phone with her. Marie has braces on her teeth. The City Council recently voted to revamp how the city collects fees from developers to increase funding for parks and recreation spaces throughout LA under the state’s Quimby Act. On Wednesday, the Los Angeles City Council unanimously approved a resolution to support Measure M, the half-cent sales tax measure on the Nov. 8 ballot that, if approved, will raise $860 million a year countywide to revolutionize LA’s transportation network and add 465,690 new jobs across the region. Parents and families are invited to an upcoming education town hall October 22, 2016. This town hall will be an opportunity for the non-profit Great Public Schools Now to learn from each other and talk about the educational needs unique to our neighborhood. ?City Council President Herb Wesson announced today he will serve as caretaker of a San Fernando Valley district that was left unrepresented by the departure of Councilman Felipe Fuentes. ?Los Angeles City Council President Herb Wesson said Thursday that he has selected himself to temporarily manage the San Fernando Valley district represented until recently by Felipe Fuentes. Wesson, whose own district stretches from Koreatown to South Los Angeles, will oversee services in the northeast Valley for the next six to eight months, depending on when the contest to replace Fuentes is decided. ?The program to provide a free year at Los Angeles Community College District was inspired by calls made under America’s College Promise. Jill Biden, the wife of Vice President Joe Biden, and Lt. Gov. Gavin Newsom joined Mayor Eric Garcetti and Los Angeles education officials Wednesday to launch a program that will provide a year of free community college tuition to Los Angeles Unified School District graduates. The Los Angeles City Council Homelessness and Poverty Committee (H&P) Chair Marqueece Harris-Dawson and Vice-Chair Councilmember José Huizar, announced this week the appointment of Meg Barclay as the City’s Homelessness Coordinator. ?For all of you who have been Saving the Drop, Mayor Garcetti will be launching the Drop Defenders online competition inviting Angelenos to showcase how they have saved water. One winner from each City Council district will be selected. They will be accepting entries starting on September 15th. For more information, click here. ?The Los Angeles City Council confirmed by a unanimous vote (13-0), the appointment of David H. Wright as General Manager of the Los Angeles Department of Water and Power (LADWP), the largest municipally-owned water and electric utility in the nation. Wright had been nominated by Mayor Eric Garcetti and approved by the Board of Water and Power Commissioners in August, pending City Council confirmation. With Los Angeles City Councilman Felipe Fuentes leaving, who�ll run Council District 7? Questions are being raised about who will govern the northeast San Fernando Valley when Los Angeles City Councilman Felipe Fuentes leaves office next week. ?US Representative Tony Cárdenas Invites you to the 2016 Job Fair. Dozens of employers looking for full-time, part time, and apprentice positions! Come with resumes and dress for success! Professional attire will be available for individuals who qualify! This week, the City Council voted to transfer nearly $2 million to the Bureau of Sanitation to help make our streets and communities safer and cleaner for all people. The City Council initially approved the funds as part of the city’s budget process, led by Councilmember Krekorian, chair of the Budget and Finance Committee. This summer, the LA Housing and Community Investment Department launched a new program to help educate Angelenos on renters’ rights under the city’s Rent Stabilization Ordinance (RSO). This week, hundreds of thousands of students in Los Angeles went back to school. As students get back to learning, the LAPD, the LA Unified School District and city officials remind parents, families and students to be safe and smart while making their way to school. ?The City of Los Angeles recently launched SaveEnergy LA, a campaign encouraging Angelenos to make small changes in their lives to reduce the amount of power they use every day. Mayor Eric Garcetti kicked off the campaign by turning off the lights at dozens of buildings, including City Hall. Customer Service Centers (CSC) are open for business the Second Saturday of each month from 9 a.m. to 1 p.m. for Customer Service Saturday. You can expect assistance from staff who are able to take payments, process service order requests, answer and resolve billing questions. You are cordially invited to “Beyond Neighborhood Councils – How to Run for Higher Office, Get Appointed to a City Commission, or Find a Job with the City”. Featured speakers include Los Angeles City Controller Ron Galperin, Board of Public Works Commissioner Joel Jacinto, and Personnel Department representatives. ?Wendy Greuel was named chair of the Los Angeles city and county agency commission that oversees homeless services, it was announced Wednesday. With temperatures expected to increase to triple digits in Los Angeles beginning Thursday, July 21 through the weekend, the Los Angeles Department of Water and Power (LADWP) urges customers to reduce their energy use where possible while not putting their health or the health of their pets at risk. With the city gripped by a dangerous heat wave, Mayor Eric Garcetti on Friday ordered that the San Fernando Valley’s seven cooling centers extend their hours over the weekend. The results are in for the 2016 Neighborhood Council Elections! 25,571 voters voted for 1,839 candidates in 82 elections and 8 selections this year. The oldest candidate was 93 years old; the youngest just 14. You’re invited to join the Neighborhood Council Sustainability Alliance (NCSA) on Saturday, July 9, for an Open Space circle (aka an “unconference”) where YOU propose topics for discussion, and then convene or join topic sessions you care most about. Below is a listing of fireworks shows in the Los Angeles area for 2016. This list is provided by the the Los Angeles Fire Department, the Los Angeles County Fire Department, and the Children’s Burn Foundation, and they will continue to add shows over the next several days, so please visit http://www.safejuly4th.org/fwshows.htm, for any possible updates. LA Animal Services is gearing up for our busiest time of the year and we need YOUR help to create life-saving space in our City shelters. ?Over the last 25 years, Metro’s growth in LA County has transformed mobility and connectivity across the region. As the nation’s third largest transit agency, the organization is governed by a 14-member Board of Directors and led by Metro CEO Phil Washington, who oversees 9,892 full-time employees. ?Southern California is in for a heat wave this weekend, as temperatures are expected to reach 100 degrees or more over the next few days. ?Do you have questions about the June 7 primary? Not sure where your polling place is or what’s on the ballot? We’ve got you covered. This month’s Emergency Management Department (EMD) bulletin focuses on neighborhood disaster planning and the 5 Steps program, the City of Los Angeles official neighborhood disaster planning tool. A community meeting regarding upcoming LADWP, LA Sanitation and LA County water enhancement projects coming to the area. As the City of Los Angeles prepares for the largest anti-poverty program in the city’s history, please see the infographic below regarding helpful facts for both employers and employees regarding the new Minimum Wage set to effect July 1, 2016. As you look for ways to make a difference in your communities on the issues you care about most, we want you to be aware of the Mayor’s Summer Night Lights program. Today Bill Clinton will be have a rally for his wife Hilary at the corner of Bradley Ave./Van Nuys Bl. in Pacoima. The event starts at 12 pm. The 1994 election made California history. The first openly gay person was elected to the California legislature. That person was Sheila Kuehl, now LA County Supervisor for the Third District which stretches from the ocean cities of Malibu, Santa Monica and Venice east to Los Feliz and through the whole San Fernando Valley to Pacoima and San Fernando. Third Annual LA River Day! Four unique federally funded programs. Up to $100,000 available per eligible household. The City Council has been working through the process of modifying and approving Mayor Eric Garcetti’s proposed $8.76 billion budget for the fiscal year beginning on July 1, 2016. ?Please join us on Saturday, June 11, 2016 for Pacoima Neighborhood Pride Day. From 8am-Noon, Neighborhood Housing Services will be painting, cleaning the community and doing light landscaping on Mercer Street between Telfair Avenue and El Dorado Avenue in Pacoima. The Department of Neighborhood Empowerment, the Valley Field Teams will host “Office Hours” Friday May 20, 2016. Below you will find the City Attorney Neighborhood Laws to keep up our neighborhood clean and safe. These are laws for different issues in the neighborhood. ?Los Angeles Unified School District officials threw their support behind Obama administration guidance released today that spells out the responsibilities of schools to prevent discrimination against transgender students. LADWP Will Host Customer Service Saturday at Four Regional Customer Service Centers on May 14, 2016 from 9 a.m. to 1 p.m. The Los Angeles City Council proclaimed Friday as Ritchie Valens Day to mark the 75th anniversary of the birth of the late rock ‘n’ roll pioneer responsible for such hits as “La Bamba” and “Donna” in a recording career cut short after eight months. Two years ago, I stood with my City Council colleagues and local business owners in the charred ashes of a massive fire that brought down the San Fernando Valley Rescue Mission’s warehouse and emergency homeless shelter in North Hollywood. We were saddened by the loss, but undaunted by the task ahead of us. That day, we asked everyone in the San Fernando Valley and beyond to join us in a campaign to rescue the Rescue Mission. WHAT: Performing and visual arts programs offered at more than 25 schools in Los Angeles Unified School District (LAUSD) Local District Northeast will be showcased during its Northeast Arts Celebration. Are you registered to vote? Are you familiar with how to register and vote in this year’s Presidential and Local Elections? If not, this event is for you. ?On May 7, the Los Angeles Police Department will host its annual citywide gun buyback initiative to remove dangerous firearms from our streets in an effort to curb gun violence. ?In true LA fashion, the city’s web portal just got a facelift. The new design, which features easy-access to city services like 3-1-1, the city’s jobs portal, tourism information, news and updates, and more, was unveiled earlier this week. The Governor also signed a bill which groups vaping into the same category— and thus restrictions— as traditional tobacco products. To help out the unfortunate drivers who’ve gotten tickets, LA Superior Court has added five new traffic ticket payment machines at courthouse locations throughout the county, so that if someone has to pay a ticket, they can at least avoid having to physically go into a courthouse to do it. ?Los Angeles animal shelters’ save rates have reached unprecedented levels, but hundreds of animals have already been put down this year. Mayor Eric Garcetti, artist Shepard Fairey, City Librarian John F. Szabo and L.A. Cultural Affairs General Manager Danielle Brazell were joined by students from the Downtown Magnets High School for the unveiling of L.A.’s first limited-edition, artist-designed library card today at the Central Library. The card launch concludes the library’s celebration of National Library Week. The Mayor’s proposed City Budget has been released and will be reviewed by the City Council’s Budget and Finance Committee during intensive hearings that begin on Wednesday, April 27th at 9 a.m. in the City Council chambers in City Hall. ?The Los Angeles City Council voted 12-0 to make permanent a temporary ban on the pet store sale of commercially bred cats, dogs and rabbits. Free medical and dental services will be available next week at the Los Angeles Convention Center for uninsured and under-insured residents. Los Angeles continues to earn its reputation for smog, but air pollution dropped to the lowest level in 17 years of monitoring. The Los Angeles-Long Beach metropolitan area continues to have the worst ozone pollution in the nation, but the area has seen marked improvement in short-term and annual particle pollution, showing its best readings in 17 years, according to a report released today by the American Lung Association. Re:code L.A. is holding a forum in Northridge Wednesday evening from 6:00 pm to 9:00pm to talk with the community about the city’s $5 million, five-year effort to update its outdated zoning code. I know. That announcement did not set you on fire. Believe me, I get it. Neighborhoods in the San Fernando Valley, Hollywood, and the Westside will feel the biggest impact from Los Angeles’ new law requiring the retrofitting of wood-frame apartment buildings to better withstand a major earthquake, according to a Times data analysis. Watch the State of the City Address Live at 5 p.m.
Today, I will be giving my third State of the City Address as your Mayor. LA Sanitation is offering free bulky item drop off events to help keep Los Angeles clean. Barry Wise trundled up to the back door of his shop, turned a key in the lock, and stepped into the Pacoima drugstore he’d owned and operated for nearly 50 years. The Los Angeles Passport Agency will be holding a Passport Day on Saturday, April 9 from 7:30am to 11:30am. No appointments are necessary, so walk-ins are welcome! Although they normally only accept expedited applications at their counter, on Passport Day they will be accepting both routine and expedited applications. Please note that their standard fees, such as the passport fees and expedite fee (if a customer opts for expedited service on that day) still apply on Passport Day. This week, the California Public Utilities Commission, the California Energy Commission, the California Independent System Operator, the Los Angeles Department of Water and Power, and Southern California Gas Company released the Aliso Canyon Risk Assessment Reportregarding the reliability of the power grid for summer 2016. The Los Angeles Emergency Management Department is evaluating community disaster readiness in the City of Los Angeles utilizing a tool called the Los Angeles Household Resiliency Survey. Metrolink’s new mobile app lets riders purchase tickets on the go through smartphones, tablets and other mobile devices. The app is now available for all Metrolink trips, including trips connecting to Los Angeles Union Station. Metro is hosting public meetings across LA County to share details of a proposed measure for the November 2016 ballot that aims to raise as much as $120 billion for new highway, bus and rail projects in LA County. Los Angeles has unveiled a database cataloging the neighborhoods with the biggest trash problem. The City unveiled an online database today that grades the cleanliness of streets and alleys across Los Angeles as part of an effort by sanitation and elected officials to determine which areas need the most cleaning. Los Angeles Animal Services wants your valuable input and feedback on how we can do even more for animals and people in the City of Los Angeles. You can help shape the future goals and priorities for your Animal Services Department. Come to a Strategic Planning Community Meeting where you’ll be able to share your thoughts and ideas! This a decisive moment. For the first time in my memory, both the Mayor and the President of the City Council have reached out to include ALL Neighborhood Councils in a critical city decision. ID can be a driver’s license, other forms of ID card, If your ID does not have a Pacoima address on it, bring your ID along with written verification with Pacoima address on it, such as: house bill, child’s report card, something with your Pacoima address on it. Must be 16 years of age or older to vote. Immigration status does not matter; all are welcome to vote. The woman who explained earthquakes to Southern Californians for 33 years is retiring from the U.S. Geological Survey. If you ever read an article about earthquakes in Southern California, chances are you’re familiar with seismologist Lucy Jones. The LADOT Parking Violations Bureau (PVB) wants to remind the public of a fast, easy and intuitive means of accessing their parking violation information along with the ability to set up notifications, and access other parking related web services. Keep LA Beautiful (an affiliate of Keep America Beautiful) has secured 1,000 syrup barrels and rain barrel conversion kits from Coca-Cola to repurpose and distribute for the residential use of rain harvesting for landscape irrigation. Map Your Neighborhood (MYN) is a free program designed by the Washington Emergency Management Department and implemented locally by the American Red Cross Los Angeles Region to improve readiness at the neighborhood level. The LA County Department of Public Health has presented these answers to frequently asked questions about the Zika Virus Disease. Once again, LAUP and El Proyecto del Barrio are proud to be a part of this great community and looking forward to a prosperous growing relationship. In an effort to maximize our time and resources, our Evaluator, Donna Escalante has put together a brief survey in Spanish and English with the five potential locations for the Community Resource Fair. The new LADBS website features an intuitive modern design with an emphasis on ease of use for all our visitors. The following candidates have been certified and will be on the ballot for our April 2 Election. Leaf Blower Exchange Registration Opens 2/23/16! South Coast Air Quality Management Division sponsors an annual Leaf Blower Exchange Program that helps clean the air through the exchange of backpack leaf blowers. The City Council unanimously voted to approve a motion introduced by Councilmembers Krekorian and Nury Martinez to explore offering LA City employees four weeks of paid parental leave after the birth or adoption of a child. Metro is set to roll out a new pilot program for paid parking at nine stations and lots across the agency’s transit lines. The Metro Board of Directors is expected to vote on the proposal in March. ?The 2nd Valley Transportation Summit is being held at CSUN on March 3rd will be an opportunity to continue the dialogue concerning transportation-related challenges and opportunities facing the San Fernando Valley. CityWatch, the online news portal, has launched a Neighborhood Council page in partnership with the Department of Neighborhood Empowerment a.k.a. EmpowerLA to support the 2016 Neighborhood Council election outreach. Mayor Eric Garcetti’s Office of Gang Reduction and Youth Development (GRYD) is currently accepting applications for Summer Night Lights (SNL) program Site Coordinators. GRYD’s mission is to strengthen youth/young adult, family and community resilience to the influence of gangs by fostering public/private collaboration and supporting community-based prevention and intervention services. The Neighborhood Council Sustainability Alliance is pleased to partner with LADWP, SELVA International, and Surfrider Foundation to offer FREE “Lawn Be Gone” Hands On Workshops (HOWs) on February 27 and March 5. Saturday, March 12, 2016 – 10 a.m.-4 p.m. This week, Councilmember Englander submitted a resolution to the Los Angeles City Council calling for the California Public Utilities Commission to investigate the unusual rate increases experienced by SoCal Gas customers this month across Los Angeles County. All high school students who reside in California’s 29th Congressional district are invited to participate in our annual 2016 Congressional Art Competition. Initiated by Members of the U.S. House of Representatives in 1982, the event is a nationwide annual art competition that allowed high school students from all fifty states, the District of Columbia, and U.S. territories to showcase their artistic ability. The deadline to register as a candidate has been extended! This is your last chance to register as a candidate for your Neighborhood Council elections. The North East Valley is the first Region in the City of Los Angeles to hold their 2016 Neighborhood Council elections. Help us get the word out and encourage worthy candidates! Find out how you can qualify for Free Cal Grant Money to attend college. Learn about the Middle Class Scholarship Program. Mayor Eric Garcetti joined Xerox for the launch of Go LA, a transportation app that provides detailed information on every available mode of getting around the Los Angeles region. El Niño is a warming of the Pacific Ocean near the equator caused by a weakening of the trade winds that normally push sun-warmed waters to the west. When ocean temperatures are warmer or cooler than normal, they can affect weather around the world. In the United States, El Niño often changes typical weather patterns and could bring drier conditions to some areas and intense rainfall amounts to others. Candidate Filing is now open for Arleta, Foothill Trails District, Mission Hills, North Hills East, Pacoima, Panorama City, Sun Valley Area, Sunland-Tujunga, and Sylmar Neighborhood Councils. The Los Angeles Neighborhood Council Budget Advocates have created a Service Report Card for citizens of Los Angeles to rate their local City Services. Every community is different and every community has their own set of problem areas. The City’s Implementation Plan for the Clean Streets Citywide Program (Council File: 15-0600-S78) aims to provide a comprehensive program to improve Angelenos’ quality of life by cleaning up our streets. Why do neighborhood councils matter and why should you run for a board seat on your NC? At their best, and some excel at this, they serve as local political organizations that are empowered to monitor the critical issues in their communities such as land use and development, transportation and parking, and public safety. Earlier this year Mayor Eric Garcetti launched several Executive Directives, one of which was the first ever Sustainable City pLAn. Sustainability is about more than combating climate change and reducing pollution: it encompasses economic development, social development, and environmental protection. ?In preparation for the holidays, L.A. Sanitation is asking people not to pour fats, oils, and grease down the drain. This can be damaging not only to pipes in the home, but also to outside sewer lines. LA Sanitation is now accepting household fryer oil for recycling at our S.A.F.E. Centers. The oil will be recycled for fuel and energy. ?This week, a public hyperlink was established on the City’s website directing users to the Los Angeles County Department of Children and Family Services’ website to provide information on adoption opportunities. ?Looking for affordable housing? There is a new resource available from the Los Angeles Housing + Community Investment Department (HCIDLA). El Ni�o Wet Weather Preparedness: WE�RE READY� ARE YOU? Los Angeles lawmakers voted unanimously Tuesday to pass a new law requiring Angelenos to lock up or disable their handguns at home if they aren’t close at hand. In an impassioned speech before the vote, City Councilman Paul Krekorian argued that the new rules would help prevent deadly accidents and youth suicides by stopping the guns from falling into the hands of curious children or despondent teenagers. Krekorian said more preschoolers are killed with guns annually than police officers. Mayor Eric Garcetti today announced the first steps of a comprehensive strategy to address the homelessness crisis in Los Angeles, an effort that would invest at least $100 million annually in City funding to help house tens of thousands of homeless individuals. The LAPD is alerting the public about a recent rash of phone scams that seek ransom for taking family members hostage. According to the police, the victims are contacted by a suspect who states they are holding a family member hostage. There has been a significant increase of copper wire thefts targeting the city’s street lighting system in various neighborhoods, causing street lights to go dark for a period of time. The City of Los Angeles is conducting a survey to gather community input with respect to vending on City sidewalks and in City parks. The Los Angeles Municipal Code prohibits vending on sidewalks and is considered a misdemeanor and vending in City parks is only allowed with a permit. The first LA police officers will begin wearing body cameras on Monday as city leaders look for funding to outfit all cops with them. ?With temperatures expected to exceed 100 degrees in the San Fernando Valley today, the Los Angeles Department of Water and Power (LADWP) urges customers to conserve energy use where possible, while not jeopardizing their health and safety. ?More than 200 people die on LA streets each year, and most of those deaths happen on just six percent of streets. In 2005, Youth Speak Collective founders David Kietzman and Whitney Kasserman saw an urgent need for educational resources and activities for youth living in the Northeast San Fernando Valley. Compelled to help fill the void, David and Whitney developed an eight-week seminar in which students explored community needs, grassroots organizing, grant writing skills to bring new resources into the community and planning to improve the health of their community. Stop Calling 911. It�s the Forest Fire You�re Smelling. People around the San Fernando Valley, Hollywood Hills, Studio City and Mount Olympus are smelling smoke and calling 911 thinking there is a wildfire near them, says the Los Angeles Fire Department’s Brian Humphrey. Can You Recognize A Heat Emergency? ?Temperatures across California will be blazing hot in the days ahead. We have your heat wave safety checklist to keep your loved ones safe. ?Los Angeles City Councilmember Felipe Fuentes, 7th District, and officials of LA Sanitation (LASAN) and the Los Angeles Department of Water and Power (LADWP) broke ground today on the Laurel Canyon Boulevard Green Street Project in Pacoima. The Los Angeles Department of Water and Power (LADWP) has proposed a 5-year water and power rate action that provides funding to accelerate the replacement of aging infrastructure, better protect against drought conditions, and meet water and power supply mandates while improving customer service. ?Six Southland counties were named disaster areas following damaging floods. Lt. Gov. Gavin Newsom today declared a state of emergency in Los Angeles and five other California counties because of damage from last weekend’s rainstorms. The Metropolitan Water District of Southern California announced today it will stop accepting rebate applications this week. With demand soaring due to the ongoing drought, the Metropolitan Water District of Southern California announced today it will stop accepting rebate applications this week from people who rip out turf lawns in favor of low-water-use landscaping. 7-Eleven has partnered with the City of Los Angeles Department of Recreation and Parks to host 7-11 Day: All Youth Swim FREE. The next English Community Police Academy will begin on July 9th, and finish with graduation on August 27th. It’s on Thursdays from 6:00 to 9:00 pm. ?TOPIC: Resolution for the California High Speed Rail Authority to remove the proposed route SR14 from possible proposed routes in the Northeast San Fernando Valley. Pacoima Neighborhood Council invites all community members to take part in this community beautification event in the city of Pacoima. ?LA partners with PulsePoint to empower residents to help save lives. Mayor Eric Garcetti and the fire chief unveiled a smartphone app Wednesday that alerts people with CPR training if someone in a nearby public area is suffering from cardiac arrest and needs their help. Pacoima Neighborhood Council would like thank you for taking the time to participate in this survey. The purpose of this survey is to gather the opinion of the Pacoima community about the High–Speed Rail. Like many Californians, I am excited when I imagine a 21st-century high-speed train racing from San Francisco to San Diego. It is incredible to consider that we Angelenos could comfortably ride a luxury train from Los Angeles to San Francisco in under three hours. ?Are you or your loved ones looking for a new place to hang out in Pacoima? Look no further. The Pacoima Neighborhood Council held a public meeting on Wednesday, Jan. 20 to discuss the SR 14, one high-speed rail route currently proposed to travel above ground through Sun Valley, Pacoima, the City of San Fernando, Sylmar and through the foothills. As the City’s imported water supply becomes more critical, so does the need to expand our local, sustainable water resources, including water recycling. Water recycling offers a reliable, economically feasible and environmentally sensitive way to augment the city’s water supplies. ?Mayor Eric Garcetti, the Los Angeles County Economic Development Corporation (LAEDC), and the U.S. Department of Commerce announced today that the first annual National Aerospace Foreign Direct Investment (FDI) Exposition will be held in Los Angeles. This is the first stand-alone FDI event in the United States co-sponsored by the Commerce Department that will focus on a single industry: aerospace manufacturing. The Pacoima Neighborhood Council announced its opposition to the controversial bullet train route that may cut through Pacoima at its monthly meeting at the Pacoima Community Center. The president alongside the neighborhood council addressed a full room at Wednesday’s meeting, which was attended by Councilmember Felipe Fuentes, the mayor of San Fernando, representatives from Assemblymember Patty Lopez’s office and the High Speed Rail Authority, and residents from Pacoima and nearby communities. LOS ANGELES — For a limited time, the Los Angeles Department of Water and Power (LADWP) is offering a $10 bill credit for new paperless billing customers. Customers who currently receive printed LADWP bills, and who sign up for paperless billing through ladwp.com, will receive a $10 credit on their next bill. Morris Pichon, a 73-year-old Pacoima resident, is a former Navy photographer. And he’s still using his camera. When Pichon spots an abandoned mattress or a car illegally selling goods on the side of the road, he takes a photo. Discovery Cube Los Angeles is officially open in the Hansen Dam Recreation Area in Council District Seven. The 71,000 square foot, hands-on museum allows kids of all ages to learn about Science, Technology, Engineering and Math through fun exhibits, displays, programs, and learning spaces. Patty Lopez, a mostly unknown candidate from San Fernando, has defeated incumbent Assemblymember Raul Bocanegra (D-Pacoima), according to the official election results released Monday. As California continues to weather through the drought, the Los Angeles Department of Water and Power’s Water Conservation Response Unit (WCRU) is stepping up public education and enforcement of the water conservation ordinance with three additional staff members and specially marked vehicles. ?The Pacoima Neighborhood Council sponsored a Back to School Backpack Giveaway event on Saturday, August 9, 2014. This Backpack Giveaway will serve the students of Haddon Elementary, Shape Elementary, and Telfair Elementary. Over 80% of the LADWP’s water is imported. In response to diminishing supplies due to environmental issues in the delta and local droughts, the City of Los Angeles has adopted several water conserving ordinances. People are losing thousands of dollars in a phone scam involving GreenDot MoneyPak. The Blvd Bike and Skate Shop recently opened its doors in the Pacoima Business District (PBD). The family owned business hand-picked Pacoima and we’re so glad they did. The shop is helping the PBD move forward because small businesses are the economic drivers of any community. Check out The Blvd Bike and Skate Shop video. Summer Night Lights means community to Pacoima. It brings families together to bond, to participate in activities and get to know their neighbors. On two occasions, the suspect sexually assaulted two female victims in the vicinity of Glenoaks Blvd and Osborne Place. The suspect approached his victims on foot. Both incidents occurred between 10:00 and 11:00 pm. Mayor Eric Garcetti today announced the completion of a six month procurement process that provides a newly designed and updated WorkSource Center system for the City of Los Angeles, focusing on practical training for emerging job sectors. The Los Angeles City Council unanimously approved the new system that is federally funded under the Workforce Investment Act. Chief Charlie Beck has submitted a request to be considered for second five-year term. The Los Angeles Police Commission now has the responsibility to respond to that request, either positively or negatively, by August 20, 2014. Persistent phone scammers are deceiving LADWP customers into paying non-existent water and power bills with threats of immediate service shut off. Don’t fall victim to phone scammers posing as LADWP “collection” personnel. ?Yesterday’s 4.4 temblor reminded us all that we live in an earthquake zone. And while a lot of us have emergency water and supplies on-hand, being prepared for a disaster means more than that – it means being financially ready. ?Just before 1 a.m. on Saturday morning, a fire destroyed the San Fernando Valley Rescue Mission ‘s emergency shelter, vehicle fleet, clothing warehouse and food pantry. It took more than 130 brave Los Angeles City firefighters to get the fire under control. Thankfully, there were no injuries, however, the damage is devastating to the Mission and the equipment it uses to serve our San Fernando Valley. Creative Open Space L.A. – Arleta/Pacoima is spearheaded by the Los Angeles Department of Recreation and Parks, and is part of a collaborative endeavor with a number of non-profit and community organizations to help increase the health and livability of communities across the city. The southbound I-5 Tuxford Street long-term on-ramp closure re-opened to traffic this Tuesday morning, January 28, 2014. The contractor, Security Paving, finished stripping the on-ramp last night. Communities can transform underused areas of L.A.’s largest public asset—our 7,500 miles of city streets—into vibrant and accessible public space with People St, a program of the City of Los Angeles Department of Transportation (LADOT). Interested in Making a Difference in Your Community? Candidate Filing Starts Today. The Candidate Filing Period is December 23, 2013 through January 22, 2014. Want More Open Space in Pacoima? Thank you all for your participation and support this past Saturday! It was an amazing event, the community came together to welcome our new Mayor. There will be upcoming CERT and CPR training courses in 2014 at Pacoima Charter School 11016 Norris Avenue Pacoima, CA 91331. On September 2, 2013, the LADWP completed the replacement of its 39-year old Customer Information System (CIS) after over three years of planning and development. Mayor Eric Garcetti will be walking and knocking on doors, in PACOIMA. The City of Los Angeles currently has a federally grant funded program in which free street trees are being planted along the parkway. The only requirements are that participants must agree to water their tree(s) and they must live within the City. When your friends arrive at LAX, the “Welcome to L.A.” photos at the airport are their first impression of our city. With your help, we’ll identify the most exciting places to feature in those photos. I want to showcase the real L.A. — your L.A.
A new Mayor, a new City Attorney, a new City Controller, and six new Councilmembers join two incumbent Councilmembers in guiding the largest city in the most populated state in the most powerful country in the world and they need your feedback. Starting June 24 through June 26, crews will continue demolishing the portion of the old I-5/SR-170 connector that sits partially over southbound I-5. For the safety of motorists, this work will require three night closures of southbound I-5 between Osborne Street and Sheldon Street, as well as night closures of southbound I-5 on-ramps at Terra Bella Street and Osborne Street. EmpowerLA Yearbooks are being delivered to Neighborhood Council Boards, neighborhood partners, City Departments, and elected officials. In the last few months there have been a few instances of individuals approaching small business customers with LADWP’s CLEO application, asking for cash up front to perform lighting retrofit work, and then never returning to perform the installations that were promised. It’s official: Eric Garcetti has won the race for Los Angeles mayor over Wendy Greuel, who conceded this morning. With 100 percent of precincts reporting, Garcetti earned 54 percent of the votes and Greuel had 46 percent, ABC News reports. The City of Los Angeles is proposing to adopt and implement an ordinance to ban single-use plastic carryout bags, charge a fee on paper bags, and promote the use of reusable bags at specified retailers in the City of Los Angeles. Eligible residents must register to vote by Monday, May 6, 2013 in order to be able to vote in the May 21, 2013 City of Los Angeles General Municipal and Special Elections. Mayor Antonio Villaraigosa joined with the US Geological Survey and the Los Angeles/Long Beach Urban Areas Security Initiative (UASI) Approval Authority members to announce $5 million in federal funds for the region’s Earthquake Early Warning System. In a city the size of Los Angeles, one of the fastest routes to City Hall is the internet. In the time it takes to find your car keys, you can be online and communicating with the Mayor and the City Council. The candidates are out there, stumping for votes, inundating inboxes, taking to Twitter and Facebook to spread their messages. No, we’re not talking about a certain upcoming mayoral election—although, like that contest, the outcome of this one could have ramifications for the future of Los Angeles. ?Click here for the questions with answers and the regional budget powerpoint results. The Spanish Version of the L.A. Budget Survey Is Here! ?Los Angeles residents will be able to complain about graffiti, abandoned furniture, potholes, broken street lights and fallen trees using their iPhone and Android smartphones starting March 18. Mayor Antonio Villaraigosa unveiled the My LA 311 mobile app and a redesigned website for the City of Los Angeles in a Google+ hangout with reporters Wednesday. The Department of City Planning is looking for volunteers for a new billboard working group. The PLUM Committee has directed us to assemble this working group to address billboard and digital billboard issues. Here is the video of this past Saturday’s CD7 Candidates Forum! Feel free to share this link with everyone. Our next Council Representative could possibly hold the office for the next 12 years. Choose wisely! Update on Digital Billboards in the City of L.A. The LA City Council’s pending new sign ordinance will not outlaw digital billboards. Despite the City’s ban on new billboards dating back to 2002, the City is in the process of approving a new ordinance that will allow new signs (including digital signs) in designated “sign districts” which are to be limited to commercial and industrial locations. A recent fight over a proposed $3 billion bond issue for street repairs illustrated the growing influence of neighborhood councils in Los Angeles City government, as they exerted enough influence to keep the measure off the ballot for now. The DREAMer Loan will be used exclusively to finance the $465 application fee for individuals applying for deferred action under the U.S. Department of Homeland Security’s Deferred Action for Childhood Arrivals (DACA) program. City Clerk June Lagmay announced today that the Office of the City Clerk – Election Division is in need of approximately 3,000 additional pollworkers to staff polls for the 2013 Municipal Elections on March 5, 2013 and May 21, 2013. Cars and drivers Insurance: Drivers pulled over by police are permitted to show officers their proof of insurance on an electronic device, such as a smartphone. PROGRAM BEGINS SATURDAY, DECEMBER 1, 2011 ( Sylmar Shelter is Delayed until Mid-December) The program will provide 1,491 beds at 19 sites in 15 cities and communities throughout the City and County of Los Angeles. As a heat wave continues to roast the Southland, the Los Angeles Department of Water and Power asks customers to keep conserving energy use where possible between 11:00 a.m. and 6:00 p.m. today, while staying safe. From http://empowerla.org/neighborhood-council-elections-beyond-the-ballot-box/ Voters in the Northeast Valley turned out for the first of 11 regional Neighborhood Council elections, exceeding expectations and raising the standard for participatory democracy. As part of the Fiscal Year 2012-2013 adopted budget, the Mayor and City Council approved a parking fine increase of $5.00 for all parking violations, except for disabled parking violations. Disabled parking violations were increased by $10.00. LADWP re-launches its popular water conservation rebate program for homes and businesses on July 1, offering rebates on more than a dozen separate water-saving incentives to encourage conservation while also saving money. From the Los Angeles Daily News, June 7, 2012. Tuesday’s primary election dumped scores of political hopefuls from the the state’s ballots. From Arcata to Arleta and San Francisco to Signal Hill, candidates for various legislative offices found their campaigns over when they did not place in the top two of vote-getters in their contests.